Buffalo Cabins - Located within a stone's throw of the Buffalo National River in Jasper, Arkansas. Beautiful luxury treetop cabins with first-class amenities. New in 2016, these cabins sleep from 8 to 18 adults (depending on size that you rent). These are great for getaways with your riding buddies, family reunions, or group travel. These quality cabins are veteran-owned and motorcycle-friendly. Located just 1 mile north of Jasper on AR 74E. Call for reservations: 870-446-6471. You can also e-mail at stay@ozarkrentals.com, or check out their website below. 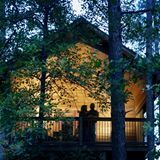 Eureka Sunset Cabins - You'll love the privacy and peaceful setting of these cozy cabins, just minutes from downtown Eureka Springs. Fireplaces and jacuzzis. Friendly staff. Clean rooms. Economical rates. Located off Hwy. 62 at 10 Dogwood Ridge, Eureka Springs. Call for reservations: (479) 253-9565.